Following a long Blues Bytes tradition, we use our Pick Hit section to present our reviewers' Top 10 lists from last year. The VizzTone and Delta Groove labels really cleaned up in 2015, according to our experts. 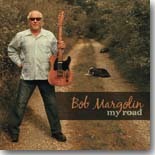 Our Surprise pick this month features the new CD, My Road, from Blues veteran Bob Margolin. This month's Flashback feature takes a look at the Delmark re-issue of Magic Sam's Black Magic. Our What's New section features reviews of new CDs from Mighty Mike Schermer, The Texas Horns, Walkin' Cane Mark, Randy McAllister, Amy Hart, Lara Price, Mick Kolassa, Nick Black, and more.